It’s ITALIA Season on the Daily Norm, celebrating, for at least two weeks, everything that’s fantastic about Italy. 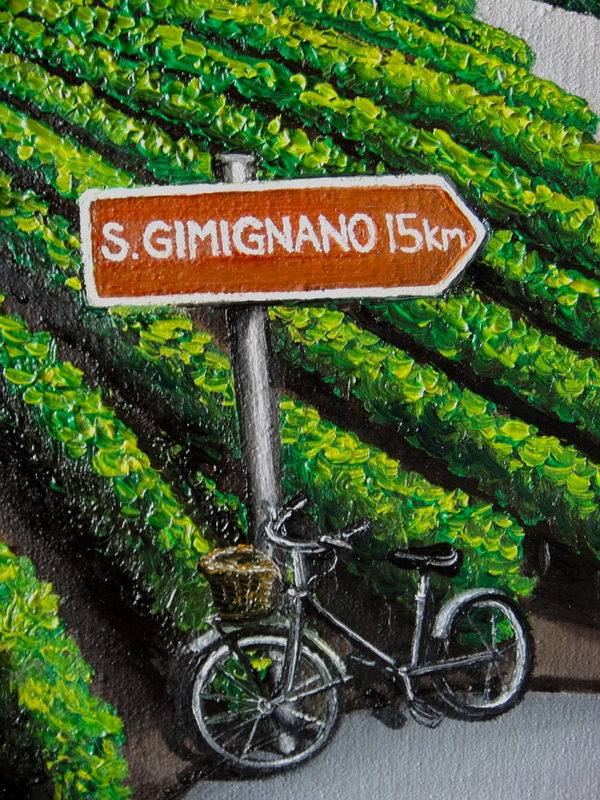 And to kick of the season, here on the Sunday Supplement, the weekly showcase of my art, I am featuring my 2010 painting, Tuscany Wharf: 15 km to San Gimignano. I was inspired to paint the scene when my Partner’s family and I were driving through the incredibly beautiful green and golden rolling hills of the Tuscan countryside. The journey, from Donoratico down on the coast up through the hills, past Volterra and on to San Gimignano involved so many curves and bends and meanders through the Tuscan countryside that when we reached a road sign advising us that after around 90 minutes of said meandering, we were finally within 15 km reach of our final destination, my Partner, whose face was very green by that point, breathed a huge sigh of relief, or as much of a sigh as could be mustered after a double dose of very soporific travel sickness tablets. As we approached San Gimignano, a UNESCO world-heritage protected town, famous for its collection of medieval towers which grew taller with each new construction as rich merchant families sought to compete with one another, the view was better than ever. 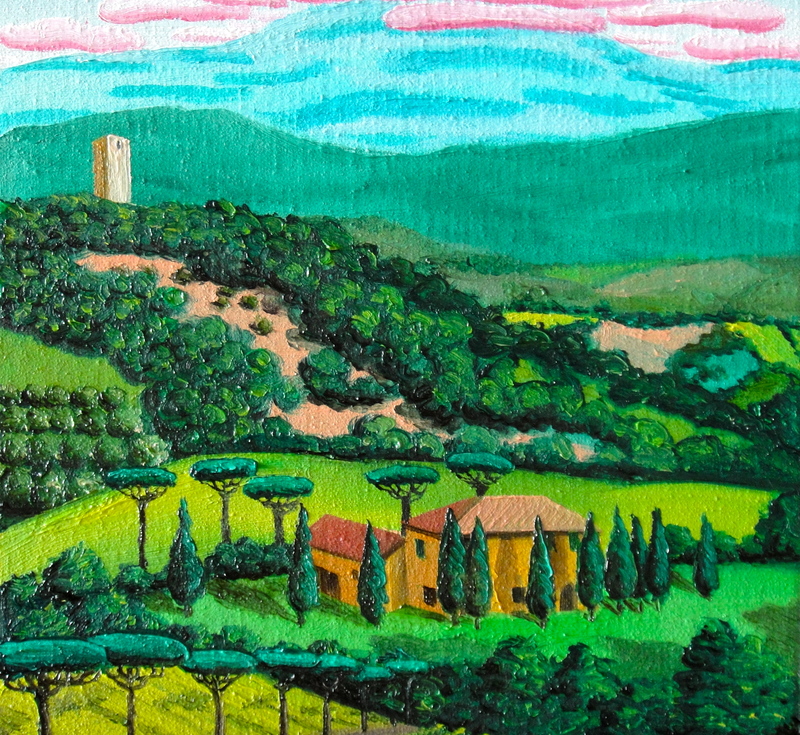 Approaching the town from some distance, seeing the iconic towers gradually emerging from behind the brow of a set of undulating hills, was quite a sight, and one which I have attempted to capture in my painting, which celebrates all the beauty of the Tuscan countryside from rows of perfectly lined up vineyards and golden fields with rolled up hay, to the curly-wurly road itself, rising and falling over and around the crests of hills, lined by cypress trees and Italian pines. However what makes this representation of Tuscany different is that sliced through one part of the landscape is a vertical insight into another world. It’s industrial Northern England, a scene with such industrialised toxicity that the smoke bellowing out from the factory chimneys pour into the Tuscan scene, filling turquoise skies with a decided collection of clouds. The English scene, which was inspired by the works of L. S. Lowry, was inserted by way of marked contrast to the beauty of the Tuscan scenery. 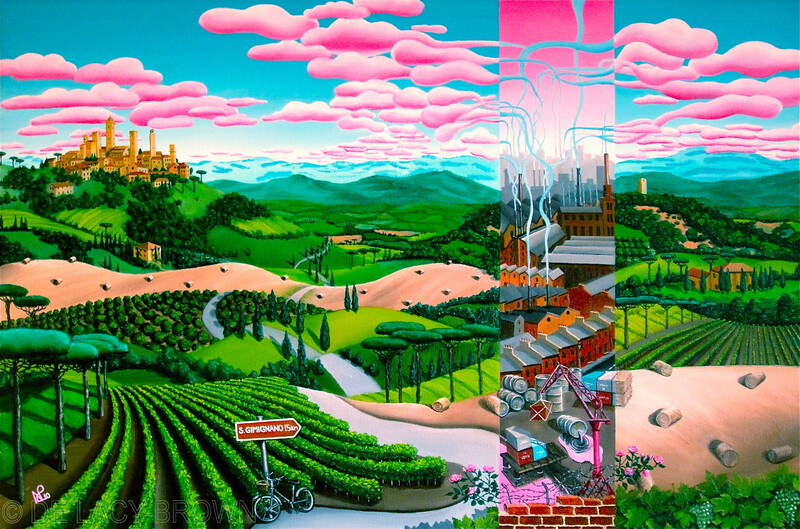 However both scenes appear to be in sync, as if they represent the same geography in a parallel universe. Where the tuscan hills roll upwards, the english scene follows the same trajectory, with a row of cramped terraced houses following the same incline of the Tuscan hill. Where in tuscany there is a round bail of hay, in the English scene, the bail of hay is replaced with a cylindrical oil container. Similarly the roses, planted next to a vineyard so the grape grower can detect disease early, is replaced by the barbed wire keeping trespassers off the industrial site. Thus it is that the two landscapes appear inescapably conflicting, and yet coexisting in perfect union. Love the art- beautiful. The final image is so interesting and unique. I visited San Gimignano years ago on my one visit to Italy. I drank the delish white wine and soaked in the views. Thanks for the reminders of being there. I love the contrast between the colour of the sky and the clouds. And the intensity of your colours – I’ve had a look at some of your portfolio on your website, quite an amazing style. Apropos ‘real media’ (as I do digital art as well) I’m a watercolourist and have never been able to handle oil well (oil paint I mean, oil itself isn’t really easy to handle, it sort of slips out of ones grip…) but you have mastered it. Thanks again! 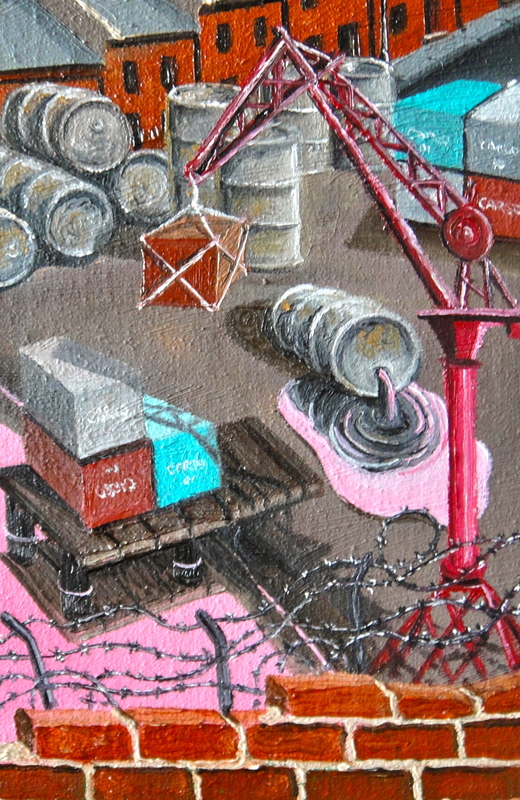 My website is a little out of date, so please do keep an eye on my blog for updates on my latest work (when I have time to finish it – I’m a barrister as well as an artist so finding time isn’t always easy!). It took me a while to get the hang of oil paint, especially as I painted for years in acrylics, but now I am so familiar with oils and their flexibility that I find the quick drying acrylics too restrictive. I also love the intensity of the colours produced by oils – can’t beat them in my opinion. Can’t wait to see some of your work on your blog! Yes, I understand that, completely. My mother (who was a painter and sculptor) used to started with oils and changed later to acrylics but, to my mind, she never quite got the intensity of colour with acrylics that can be achieved with oils. Eek! Finding the time to paint (and blog) if you’re a barrister must be tough! Hopefully you’ll enjoy my artwork, the stuff in the posts is mostly experimental and it’s a bit different from the background. You might also like the stuff I have in my Redbubble portfolio – links in my blog to that from, I think my About page.